Notes: 24 hour access to cemetery with limited office hours. Restroom and other amenities available during office ours only. May he be a meletz yosher for the all of us. He was a very special person. 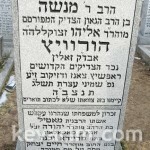 I have discovered lately I’m a cousin of R’Menashe Horowitz from his paternal uncle. I have never meet the Rev and I know his wife and children died in the Holocaust. I’m wondering if there are any living relatives of him as I would love to get in touch with them. Or someone who has pictures or any souvenirs with him. I am a nephew of his and I have a couple of pictures of him I have his hats and shtreimilech and his gartel! Hi. 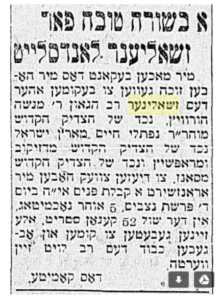 My grandmother’s name was Miriam Horowitz Pohrille (married to Rav Elimelech Pohrille of New York’s Lower East Side). Does anyone know if this is a relative? I know the names Chaim and Pinchas are both in our family history, but not Menashe or Eliyahu. Thanks. For anyone interested in knowing how the Rov was saved from the war, here is the story: One of the Rov’s daughters married someone before the war and unfortunately the marriage did not go according to plan! When the Rov demanded a “Get” from his son-in-law he chose not to give one and he ran away to America! The Rov went on to America to chase the guy to get a “Get”! Being that he was in America he was saved from the war! “Moh rabu masecha hashem”! The Rov was very good friends with th Satmar Rebbe ( R’ Yoel ). The Satmar Rebbe was machshiv him to the umpth degree! It’s known in the family that the Rov was a bigger “kanoi” than the Satmar Rebbe! 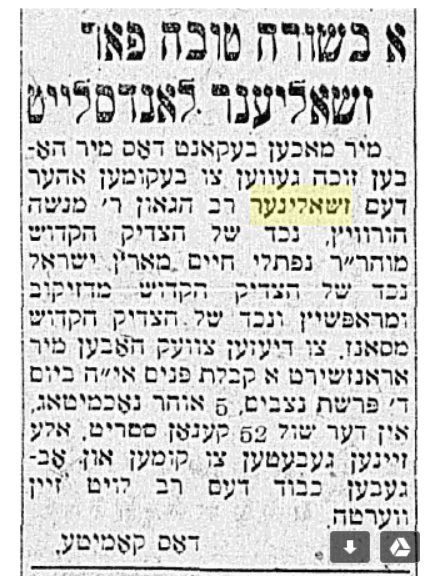 When the Satmer Rebbe wanted to publish adds in the paper screaming against the “medinah” the Rov told him that the paper company is not Shomer Shabbos and he should not put adds there! The Satmar Rebbe asked no questions and agreed! 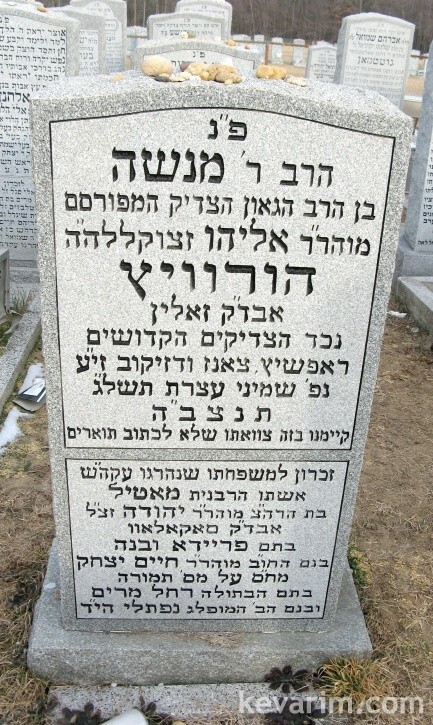 He was a major Kanei And gadol as my cousin sruli wrote he was very close with the Rebbe Rav Yoilish.